Over the past week I've been touched that three people have left me blog awards. While I don't blog for awards, it's nice to know that someone is reading and maybe using some information on my blog. A while ago I tried to simplify my blog to show just the most simple information, which is what I am doing to educate my children; and while I appreciate awards, I feel very strange accepting and passing them along. I do, however, realize that the three people who gave me the awards took the time to bestow them upon me, and for that I am grateful. 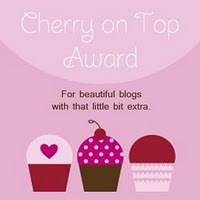 The first award is the Cherry On Top Blog Award. It was given to me by Rebecca over at Mom's Mustard Seeds. Rebecca has a new look to her blog and wants to help homeschooling moms memorize and draw upon God's word in their lives. She has a weekly link-up to memorize scripture, so check it out. 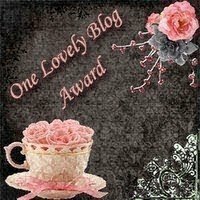 The second award, the One Lovely Blog Award, was given to me by Renee at Little Homeschool on the Prairie and Pam at Wildflower Paths. They are both new blogs for me to be reading, so I look forward to following them on their journey. I wanted to acknowledge the receipt of these awards and share some blogs that you might like to visit. (is this breaking the rules of the award? I don't know....) If you stop by that person's blog, please leave them a comment and encourage them in this funny thing called homeschooling. I love this site! There are lots of printables ( I like the mental math worksheets) and just great knowledge all-around! This is quite a political homeschooling blog, but that's ok with me. If you disagree with her conservative politics, then go right past this link. You will LOVE her post about a government run Facebook! Sue is very popular in the blogging world. I have enjoyed participating in her weekly blog hop and she has tons of great ideas. Check out her banana bread! Wonder Mom is a former public school educator just like me, and I have been enjoying her blog very much. I stumbled upon Heather's blog last week, and it's very clever. I love her Post It Note Tuesday! I hope I've given you five new blogs to check out, and remember - please leave them a comment when you stop by to take a look.